This fine male duo only ever had 2 singles issued on Buzz Cason’s Nashville based Elf label, but they cut many more sides around the time that Cry Baby Cry was selling well. But whether any of them will be a match for that classic we may never know. It seems unlikely as not many can even get into the same league – not just for the superb false ending, or the insidious downward bass and guitar lines on the hook, or the tasteful female chorus and horn charts. 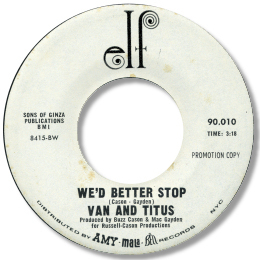 But mainly because of the intense, almost devotional atmosphere the disc generates through the background organ and the rap under which Van (or Titus) hums his encouragement and agreement. 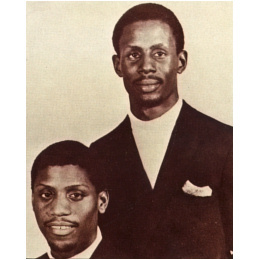 These guys may not have been the greatest singers in the world, but on this record they scaled the real heights. Kudos to everyone involved in the production as well - Charles Chalmers, Cason and guitarist Mac Gayden. In amongst the understandable enthusiasm for this disc, soul fans have rather unjustly passed over their first effort. We'd Better Stop is another class ballad performance, featuring a stop/go rhythm track and strong horns. Love the way they urge each other on through the song – turns the rather odd notion of two male voices singing to each other into perfect sense. UPDATE ~ Denise Borden writes with the fascinating news that the real identities of Van & Titus are George Brantley and his brother Billy. Billy also recorded some fine sides for Sound Stage 7. Denise is trying to get some new action for "Cry Baby Cry" and if anybody wishes to get in touch with her about this or the brothers Brantley please contact me in the first instance. 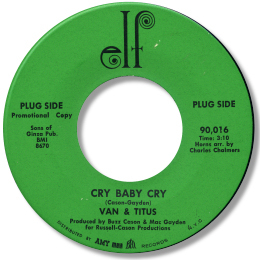 Note: A slightly differnet and marginally longer cut of “Cry baby cry” was issued on “Dave Godin’s Deep Soul Treasures Vol 1” on UK Kent CDKEND 143.